Appearance: Erza is a young woman who has long, scarlet hair and brown eyes. She also has an artificial right eye made by Curt Von Doom, which replaced the one she lost as a child. She has a slender figure that boys & girls describes as amazing. Personality: Erza is a very strict girl. She is also very impatient, disliking people who don't answer her questions quickly enough. This, coupled with her own tragic childhood, caused many of her friends/ opponents to avoid her due to her social awkwardness. However, she has a great sense of justice and pride. Erza is "cool and beautiful, warm and full of passion." Biography: Erza grew up in Rosemary Village, near the same place where Yoko Ritona and Kamina Jiha lived as teens, wich is now Kamina City. When Rosemary Village was attacked by a mad villain named Darth Vader & his "Star Fleet" forces, Erza managed to save both Yoko & Kamina from capture by hiding them inside a crate, but got caught herself as a result. She was enslaved by the cult and forced to build the New Star, a structure developed for the purpose of resurrecting the Death Star from the Star Wars movies. She was imprisoned together with several other slaves, most of them were children. While they were asking each other for their names, she said that her name was just "Erza", so a friend of hers decided to give her the surname "Scarlet" after her scarlet hair so they would never forget it. Despite the harsh conditions of her enslavement and labor, Erza became close friends with the other children. One day, she came up with a plan for her and all her friends to escape from the New Star. They were unfortunately caught by the guards, or Storm Troopers, who decided to send the escape's mastermind to the building's disciplinary chamber, while the rest would be deprived of food for three days. Seeing how fearful her friends was, Erza prepared to take the blame herself, but the same boy who gave her the last nams "Scarlet" announced himself as one of the masterminds minions instead. However, the guards reasoned that Erza was the one responsible and sent her to the disciplinary chamber, where she was tortured to the brink of death and lost her right eye. Her good friend rescued her, but was captured soon after & eventuallt killed for his betrayal to Lord Vader. Finally fed up with their torment, Erza staged a revolt against their captors so they could escape and save the other children. The revolt appeared to be successful at its inception until Vader's loyal servant, Darth Maul, arrived to repress the slaves, causing most of the other slaves to retreat. During the attack, Erza watched in horror as her friend's lower jaw was blasted off by a powerfull gun, while another friend sacrificed himself to defend Erza from another one of Darth Maul's attacks. 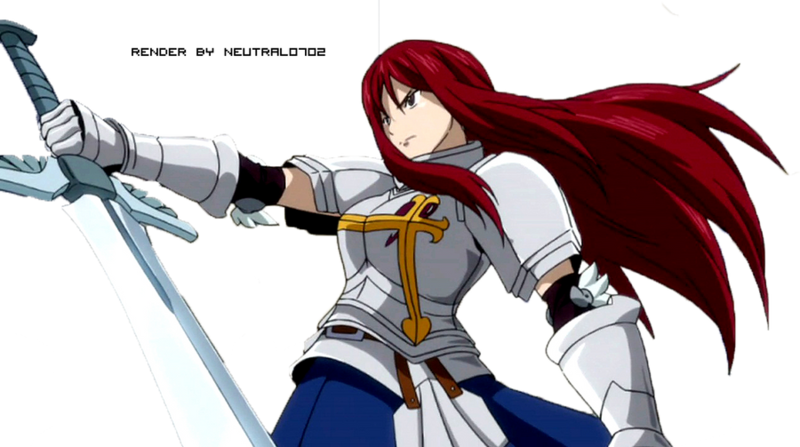 In her sadness & rage, Erza's emotions were hurt to the point of being completelly heartbroken & mad, and she used a nearby sword to fight against the guards, finishing the revolt, wich is why she's a skilled sword weilder like she is today. As the other slaves boarded ships meant to ensure their freedom. The ship that Erza was on reached the small European country of Latveria & crash landed there. Erza was the only survivor of the crash & weaklly walked into the city. Soon, Latveria's very own loving man, Boris, saw Erza in her weakened state & felt very sorry for her & thought she needed immideate medical attention, where she was treated by the Latverian doctors & nurses back to health. For a while, to cover up Erza's lost eye, she wore an eye patch. Boris then brought Erza to the massive castle in Latveria see the country's king himself, Dr Curt Von Doom! He heard of the her state & lost eye & gave her an artificial eye he had made to replace the one she lost. With her eye healed Erza shed tears of joy, which only came out of her real, left eye, though Erza didn't mind as she said she had already shed half of her tears & she became one of Von Doom's very good friends, & soon left the European country to America to start her own life. As the years passed, Erza became interested in dinosaurs. The very first dinosaur she saw was a living, breathing one, a Ceratosaurus. She loved it automatically & named it Natsu. Now, Erza has a team of dinosaurs wich she has named "Fairy Tail," & went into the JFC tournaments, winning a few tournaments with her sucess for 4 straight years now, ever since she was 15! But the haunting memories of Lord Vader still haunt her, even today. & she wishes to see their downfall.